This article first appeared at The Daily Beast. It turns out that kids today want the same thing their parents did—a home of their own that they can afford to raise a family in. It’s been seven years since I wrote about “the screwed generation.” The story told has since become familiar: Millennials, then largely in their twenties, faced a future of limited economic opportunity, lower incomes, and too few permanent, high-paying jobs; of soaring college debt and structural insecurity (PDF). The Census Bureau estimates that, even when working full-time, they earn $2000 less than the same age group made in 1980 (PDF). More than 20 percent of people 18 to 34 live in poverty, up from 14 percent in 1980 (PDF). Incredibly, many pundits applauded these conditions and credited millennials, forced by economic circumstances into difficult choices, for fulfilling the old boomer dreams that the boomers themselves had long since abandoned of a less materialistic, greener future in dense and heavily planned urban environments. It has been often asserted that millennials (defined as the generation born between 1982 and 2002) do not want to buy homes or live in suburbia; Fast Company, saw this as “an evolution of consciousness.” The Guardian declares that millennials are refusing to accept “the economic status quo” while Wall Street looked forward to profiting from the idea that millennials will be satisfied to live within a “rentership society” (PDF). But millennials, as noted in a new paper from Anne Snyder and Alicia Kurimska, aren’t embracing downward mobility but rather are increasingly creating their own aspirational strategies (PDF). Some are doing this consciously by ignoring the wise planners and establishing homes for themselves in suburban and Sun Belt locales once considered insufficiently hip. Despite the hype from the press and urban planners, millennials are following in the footsteps of previous generations by locating on the periphery major metropolitan areas and Sun Belt cities, most of which are simply agglomerations of suburbs. This pattern seems certain to accelerate as millennials enter their thirties, the age when contemporary populations tend to marry, settle down, and have children. To be sure, notes Pew, more 18- to 34-year-olds now live with their parents than with spouses or significant others for the first time since the question was first asked in the 1880s. But when they do leave the nest, albeit later than in previous generations, they are becoming adults whose collective decisions are not so different from those of their parents. Their searches for homeownership and procreation reflect this trend. It turns out that millennials did not reject homeownership because of their enhanced social consciousness, but because of high prices and low incomes. 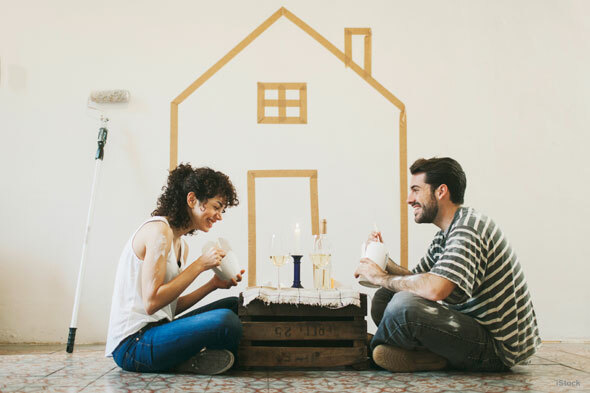 In survey after survey, the clear majority of millennials—roughly 80 percent, including the vast majority of renters—express interest in acquiring a home of their own. A Fannie Mae survey of people under 40 found that the vast majority thought owning made more financial sense, a sentiment shared by an even larger share of owners (PDF). They cited such things as asset appreciation, control over the living environment, and a hedge against rent increases. The average millennial is now in their late twenties, and will be well into their thirties by the end of the decade. Already, 16 million millennials have had children, up from barely 6 million a decade ago, a number that is likely to soar in coming years, particularly if this group continues the recent trend of more women, and especially better educated ones, having children in their forties. Despite endless talk about millennials as the group triggering a “back to the city” movement, census data shows that their populations in many core cities are stagnating or declining. In April 2016, the real estate website Trulia found that millennials were rushing out of expensive cities, with the group making up roughly a quarter of the population in New York and Washington, D.C., but accounting for half of all departures from them. Between 2013 and 2014, only 2,662 people between the ages of 25 and 34 migrated to D.C., according to census data, roughly a quarter of the 10,430 people in that age bracket who arrived between 2010 and 2011. Since 2010, the 20 to 29 populations have declined in the core areas of much celebrated youth magnets including Chicago (-0.6 percent) and Portland (-2.5 percent). Other areas, like Los Angeles and Boston, have lost millennials since 2015. Costs appear to be key here. According to Zillow, for workers between the ages of 22 and 34, rent costs claim upwards of 45 percent of income in Los Angeles, San Francisco, New York, and Miami, compared to closer to 30 percent of income in metropolitan areas like Dallas-Fort Worth and Houston. The costs of purchasing a house are even more lopsided. In Los Angeles and the Bay Area, a monthly mortgage takes, on average, close to 40 percent of income, compared to 15 percent nationally. In many cities millennials seem destined to live as renters, without gaining any equity in property. In San Francisco, 18- to 24-year-olds now make up one of the fastest-growing homeless populations. A recent survey by the UCLA Luskin School suggests that 18- to 29-year-olds were the age group least satisfied with life in Los Angeles (PDF), perhaps something reflected in the overbuilt and increasingly vacant downtown market. Similarly a recent USC study found that high prices made attracting talent increasingly difficult. In the Bay Area, according to ULI, 74 percent of millennials are considering an exit, largely due to high housing prices. In New York, incomes for people aged 18 to 29 have dropped in real terms since 2000, despite considerably higher education levels among millennials (PDF). At the same time, rents have shot up by 75 percent. Meanwhile, the much mocked suburbs have continued to dominate population trends, including among millennials. As people age, they tend, economist Jed Kolko notes, to move out of core cities to suburban locations. Although younger millennials have tended toward core cities more than previous generations had, the website FiveThirtyEight notes that as they age they actually move to suburban locations at a still higher clip than those their age have in the past. We have already passed, in the words of USC demographer Dowell Myers, “peak millennial,” and are seeing the birth of a new suburban wave (PDF). To some extent, the meme about millennials and cities never quite fit reality outside of that observed by journalists in media centers like New York, D.C., and San Francisco. More than 80 percent of 25- to 34-year-olds in major metropolitan areas already live in suburbs and exurbs, according to the latest data—a share that is little changed from 2010 or 2000. Suburban tastes remain predominant with 4 in 5 people under 45 preferring the single-family detached houses most often in suburban locales (PDF). Surveys such as those from the Conference Board and Neilson consistently find that most millennials see suburbs as the ideal place to live in the long run (PDF). According to a recent National Homebuilders Association report, more than 2 in 3 millennials, including most of those living in cities, would prefer a house in the suburbs. In the process, note authors Snyder and Kurimska, their generation is also changing suburbia. “These transplants value high social cohesion and want neighborhoods with walking trails and other community features like fitness centers, local shops and manmade lakes,” they observe. They may also initially at least choose smaller homes, according to Zillow, and often in places closer to work and with more things close by to do. The good news for them: The majority of new jobs continue to be created in suburbs, along with most theaters, ethnic restaurants, and music venues. At the same time, millennials are shifting to different regions. Much of this has to do with housing costs. The income required to buy a home in Silicon Valley ($216,000), San Francisco ($171,000), Los Angeles ($115,000), or New York City ($100,000) dwarfs what is required in places like Orlando ($54,000), San Antonio ($54,000), or Nashville ($47,000). Not coincidentally, those more affordable places are growing their millennial populations far more quickly. The Millennial homeownership rates is 37 percent in Nashville, 29 percent in San Antonio and 27 percent in Orlando, compared to under 20 percent in New York, Los Angeles and San Francisco. To be sure, some millennials are moving into downtowns in these places, at least for a few years, but many more remain in what Grist called “sprawling car dependent cities.” Among the 10 major metropolitan areas whose 25- to 34-year-old populations grew most rapidly between 2010 and 2016, seven have more than 95 percent of their population in suburban or exurban settings. In fact, most of the places with the biggest growth among millennials are highly suburban, sprawling cities. The top 10 regions with the fastest growth in their 25- to 34-year-old populations since 2000 include nontraditional urban areas such as Austin, Orlando, San Antonio, San Bernardino-Riverside, Las Vegas, Houston, Oklahoma City, and Jacksonville. In contrast, Boston ranks 40th out of 53 metro regions, New York 44th, San Jose 47th, Los Angeles 48th, and Chicago 51st. So perhaps there is hope, after all, of millennials as a “hero generation.” As more of them follow their parents’ path to homes of their own in the suburbs and the Sun Belt’s sprawling metros, they will surely be changed by their environment and they will surely change it. Parenting, as well as homeownership, tends to make people more conservative. While the strongest population growth now takes place in what Jed Kolko calls “the suburbiest” suburbs, those on the outer fringes, even there millennials are drawn to locations with town centers—whether restored or created—and prefer things such as bike trails and parks over golf and malls. The millennial suburb, as MIT’s Alan Berger has noted, will be different—more walkable, more environmentally sustainable, and likely more connected eventually by autonomous technologies. While millennials may push back against the efforts of progressives, evident in California particularly, to limit suburban development that thus closes off their housing options, they will also oppose the culturally conservative agendas that long dominated many suburbs. This will be particularly true in areas attracting young minorities, such as northern Virginia, Ft. Bend County, outside of Houston, and Orange County, California. In this sense, the millennials may be our best hope for a more reasoned future. They are unlikely—particularly as they raise families—to embrace planners’ fantasies of a high-density future. What they can accomplish is to shift the debate about how we live toward a more reasoned, collaborative, tolerant but also family-friendly direction. That alone would make them smarter than their parents. Homepage photo credit: Financial Resource Center.